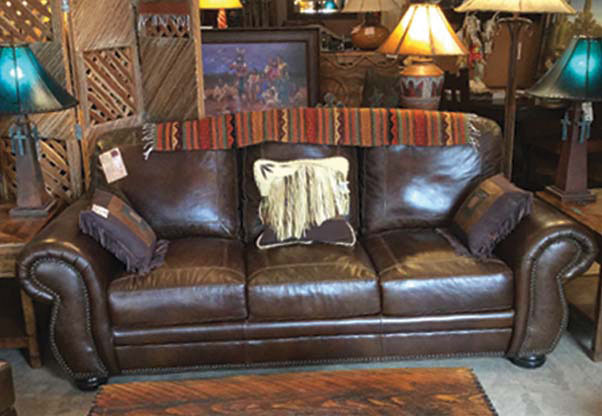 CAVE CREEK – Hard to believe but Out West Furniture Gallery is bringing in even more leather furniture. It’s a literal leather bonanza! The family-owned/operated business (by Beverly and Robert Sexton, and their son, Zack) strives to champion local artisans and is a firm proponent of “Made in America” products. Leather sofas, chairs and head/footboards come is various hues, sizes and textures. Dining room tables can be one-of-a-kind, because Out West has each one made to a family’s specification. There are examples in the showroom, and given the new year, the Sextons are changing things up, so many floor models are deeply discounted. “We always have different sales, so it’s worth it to stop by and find some great deals,” Zack offered. In addition to unique furniture in all styles (Spanish, Old World, Western, Southwestern, Traditional, Contemporary), Out West truly has wares that can fill a whole room or dress up an empty niche – decorations, lamps, giclee paintings, window cornices, mirrors, custom bedding and bed runners. No matter your design flair, Out West features all sorts of woods and inlays – alder, barn wood, wormwood, turquoise, desert twigs and saguaro ribs, slate, travertine, wrought iron, tile, metal, mesquite, copper – in buffets, kitchen tables/chairs, coffee tables, benches, end tables, bars/bistros, all genuinely capturing the Arizona experience. The folks at Out West invite their neighbors to come in and see how they can give their haciendas a whole new look in 2019. Beverly is a designer and is sure to inspire! Robert handles all the reupholstery, so keep his skills in mind if you have a well-loved piece that needs a facelift. Out West is open seven days a week (Mon – Sat: 10 a.m. – 5 p.m. / Sunday: 12 – 4 p.m.) and is located at 38252 W. Jaqueline Dr. See more at outwestinteriors.com or phone 480-575-8000 with queries.